Press Release: In the March Issue - Expanding Care, Everywhere. Why Keeping Patients Healthy Pays Off. 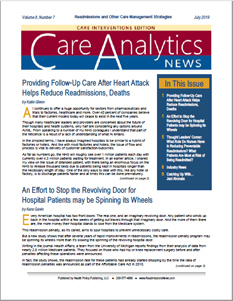 MODESTO CA USA -- PREDICTIVE MODELING UPDATE NEWS SERVICE -- MARCH 29, 2019: The March issue of Readmissions News features the article "Expanding Care, Everywhere. Why Keeping Patients Healthy Pays Off" by Robin Hill. Readmissions News is the monthly publication from Health Policy Publishing, LLC, which also offers Accountable Care News; Population Health News (with Medical Home News supplement); Care Analytics News; Value-Based Payment News; Health Insurance Marketplace Bulletin; Healthcare Innovation Bulletin; HealthChangeBulletin and Healthcare Innovation Bulletin. Thought Leaders' Corner: How can mobile-enabled remote patient monitoring improve medication adherence? Catching up with... Nakeisha M. Curry, M.D. Readmissions News subscribers receive this and future twelve page monthly issues, with a choice of electronic or print newsletter delivery, or both, and online access to past issues and more. Cutting edge information to help you keep on top of clinical, regulatory, operational, strategic and marketplace developments regarding hospital readmissions. Each issue has twelve pages with detailed feature articles contributed by leading national experts and operators in the field, Thought Leader insights; Industry Briefs; Profile of a key individual involved with hospital readmissions management; plus more.